Fished Lake Champlain today from 7am until 5:20pm. Started in the islands with high hopes. After punching holes, I fished three of them with no bites and then bam, first fish… short crappie! 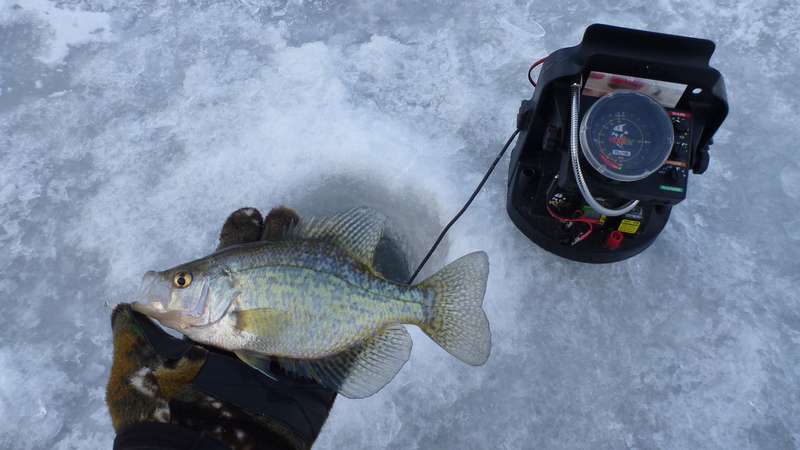 To make it better, I saw fish on the Vexilar so I threw my jig back down and bam another crappie! This one was a keeper. In the near distance, I could hear my buddies getting pumped up as well as they ripped specks as well. I said to myself “oh boy, this is going to be a good day!” From there, it didn’t get much better though. The fishing started slow and progressively got worse. They were there but they had lock jaw. It was a mixed bag of perch, bluegill, pumpkinseed, and crappie. To top it off the wind blew harder than predicted and the snow was blowing sideways. Not idea conditions for fishing without a shack! We stayed there until just before noon then headed a bit more south. I left with 3 crappie in my bucket but caught 8 total. When we got to the second spot the sun was shining and the wind was a bit more calm. It didn’t matter at this point how the fishing was because the weather boosted moral! When we got out to the cove, I could see weeds through the ice. Best part was, the water was clear enough to sight fish. After sight fishing Sunday, I have been craving more! Without my flip over, my visibility was limited but I was still able to make out parts of the fish. 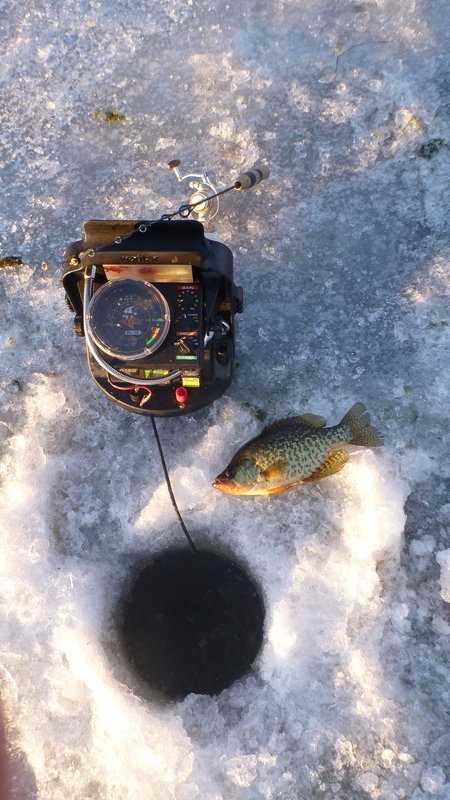 I put quite a few fish on the ice here including some quality bluegill and pumpkinseed. The rest of the day was fairly consistent with certain holes producing far more fish than others. Using the Aqua Vu camera, I got to see large pods of fish hanging out waiting to be caught! I also was able to locate weed edges where fish were ready to ambush their meals. Bright colors seemed to be the ticket today. Red maggots were very productive but white ones were more visible in the clear water. I tended to mix colors but always had white on the outside so I could see it flap as it was twitched by the rod. The fish stayed tight to the bottom all day with the exception for holes that held weeds. Those fish were suspended significantly more. One more day of fishing left to wrap up this week. I’ve put in some hours and gained some new knowledge in both technique and locations. Stay tuned for my total hours for the week and a report from the river! Oh and sorry, no pictures! I stayed too busy today! I headed out early this morning to test out a new spot on the Connecticut River. I was on the ice at sunrise with not much of an idea of where to start but I had checked out google earth satellite photos last night and pinpointed a few areas that got my interest. I had a hunch that there were crappie lurking somewhere and being that were was deep water I figured I’d start there. A good chunk of the water looked to be shallow so I didn’t even bother checking it all day. The first set of holes I punched didn’t produce so they were quickly abandoned. They ranged in depth from 15-22 feet which was about what I was looking for. I moved on to location number two which looked very similar from above but was shaded by the north eastern tree line. After punching about 50 holes I figured it was time to wet a line. When I put my Vexilar down and turned it on, the screen lit up just like I wanted it to! I had 10 feet of fish stacked up from the bottom. It took me only one hole land my first fish… Too bad it was a shiner! The fish were very sluggish throughout the entire day but I still managed a decent number. A few holes later, I was able to work a crappie out of the school below my jig. It was a solid 9″ fish. Throughout the rest of the day I iced 13 legal crappie and numerous shorts. Other than crappie and shiners, I caught and released around 2 dozen perch, some of which were 14″+, a bunch of pumpkinseed, some very nice bluegill, and 2 pike. As usual, I tried to only fish above the cluster of crappie and pick them off the top so I didn’t disturb the bunch but that didn’t work. In general, I found that the fish on top were not active and the fish in the middle and on the bottom would at least check it out. In most cases I was only able to catch one per hole. 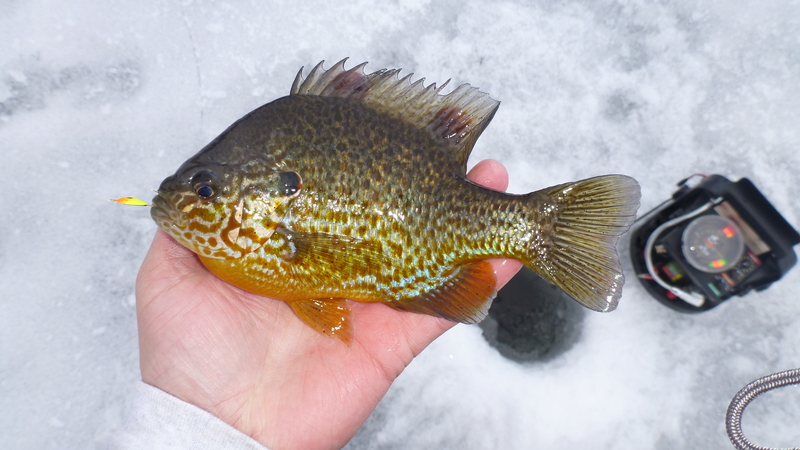 In holes that had perch, pumpkinseed, pike, and bluegill there were no crappie suspended. All these fish were picked from right off the bottom and were unwilling to move more than a foot up. I tried using my Aqua Vu camera today but I wasn’t able to see much. The water was cloudy and being so deep I could not see much beyond a foot or two. I tried just about every combination of jig, plastic, and spikes that I could put together. The two set ups that I found to be effective were a horizontal gold jig, black Maki by Maki Plastics, no maggot, and horizontal white (glow) jig, milky pink Guppi by Maki Plastics, and red maggot. Any bright color made the fish disappear in a hurry. There were only a few other holes (other than the hundreds that I punched!) as its a haul to get to. It was a great day to on the ice and I think I’ve found a spot that I will be returning to very soon! Back at it tomorrow. Stay tuned! After a slow tournament day at Lapham’s Bay on Lake Champlain, I felt the need to get out and catch some fish! I got going early and hit a small inland pond on the way to the Connecticut River. I fished there for a few hours starting at daylight and was on my way around 11am. 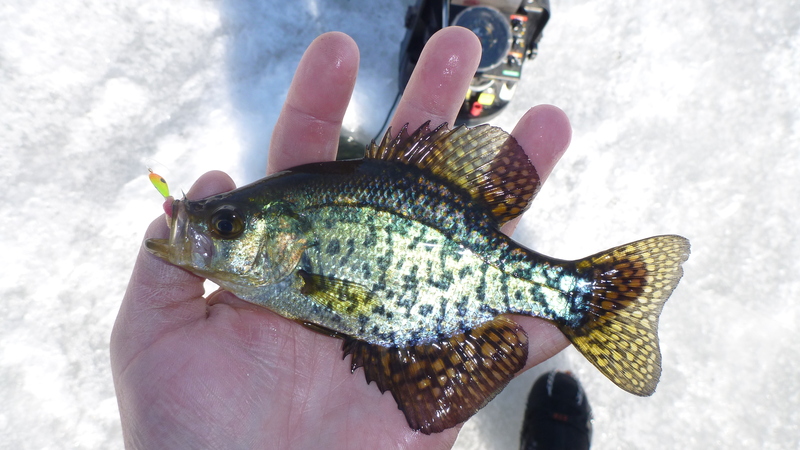 Lots of bluegill and pumpkinseed were caught and I noticed a lot of hybridization markings of the two. Very cool looking fish! Most of the fish caught at this pond were by sight fishing as the water was very clear. I was able to see them without using my Clam flip but when I did use it I could be selective with the fish I caught. I could take my bait out of the active zone when a smaller fish came in. I can’t wait to get back on this pond. It reminds me of where I laker fish in one of the crystal clear waters of the NEK! 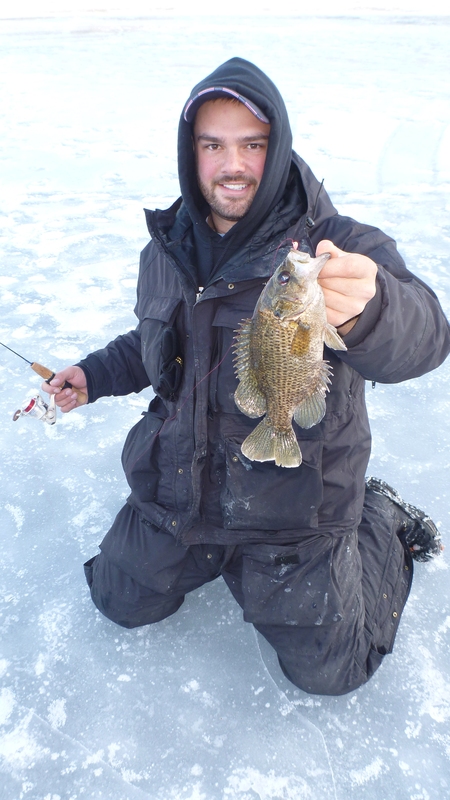 I also caught one toad rockbass! When I got onto the Connecticut River I punched out my holes from the trip I took on Friday. As I approached my first hole I pulled out my Aqua Vu Micro camera only to find out that the battery was dead. Even though I couldn’t confirm there were fish in the holes prior to fishing I knew there would be. Quickly, I got into the fish. The numbers were not as good as my last outing but the fish were quality. 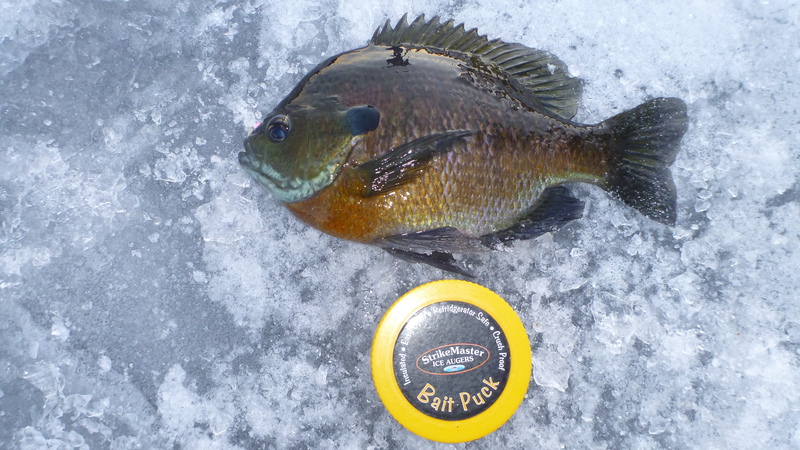 Lots of bluegill in the 8-10″ range and a few over 10″. I only caught 11 crappie today, two of which were legal. I dropped a few more of keeper size in the hole. All fish were released to be caught another day! Most of the fish I caught today changed their pattern as darkness approached. Upon my arrival, the water was draining out of this section of river to below the nearest dam. The fish were holding tight to the bottom but were active if provoked. As the water levels started to recharge themselves, the ice started making noise signaling that the level was rising. 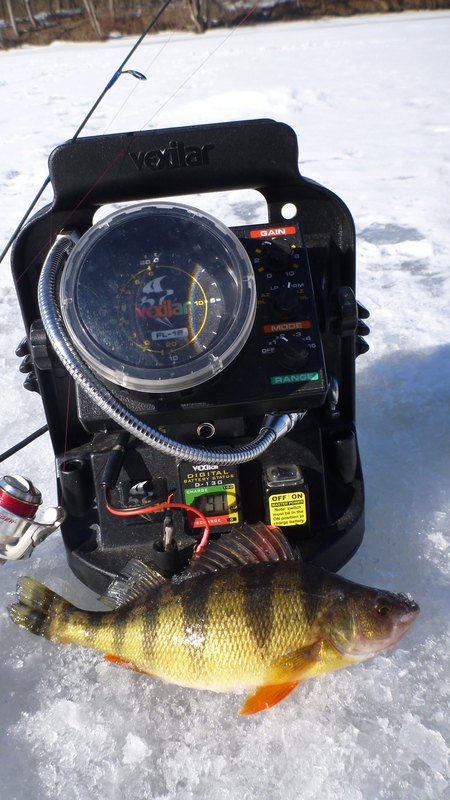 At this time, around 3pm, the fish moved up and suspended somewhere between 2-4′ below the ice. This was about 3 hours after the water gates were closed. We called it quits around 4:45 because the fish stopped being active. Right now, both my Vexilar and camera are on the charger getting ready for my outing tomorrow. I’m not sure where I am heading yet but hope where ever it is, there will be some flat fish! Tournament day… Could have gone better! No much to say other than I couldn’t find the crappie. 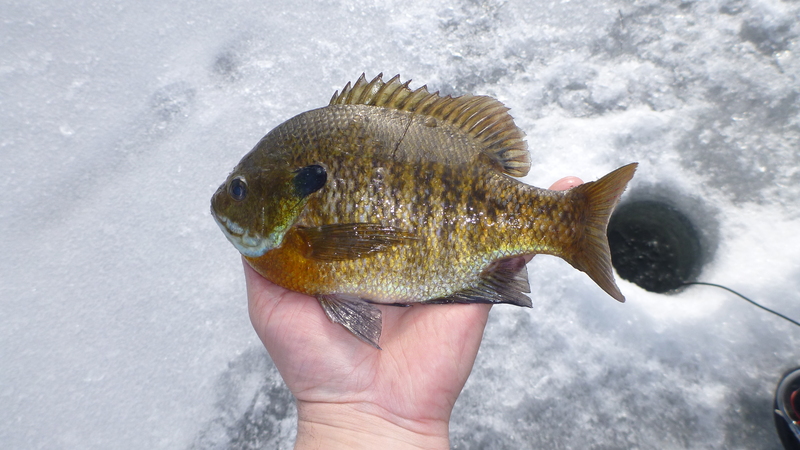 I caught plenty of bluegill and pumpkinseed throughout the day as well as a few nice perch and bass. It seemed like the people that did well stayed put all day with a few exceptions. Some days you catch them some days you don’t. There’s always next time! Lake Champlain has its ways! 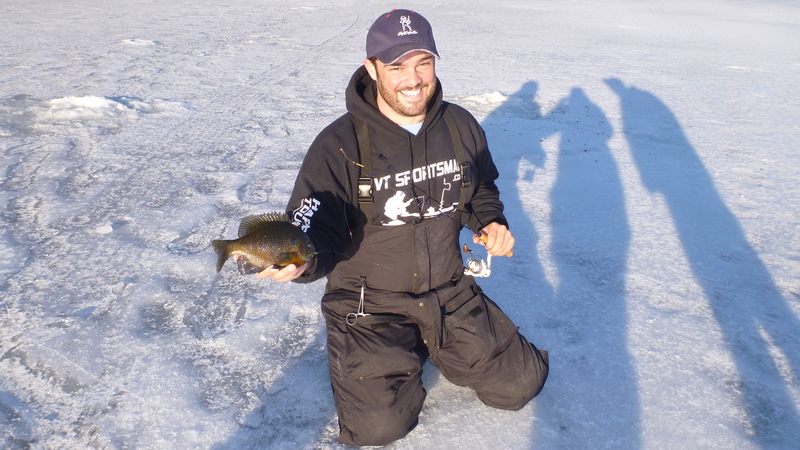 For those of you interested, here’s the link to the website – http://www.vtsportsman.com/2011_Tournament_Schedule.html. and here is the link to the forum http://vtsportsman.proboards.com/index.cgi?. Check it out and get in on the info with some input of your own! The next tournament is at Larabees Point on March 3rd. I headed to the Connecticut River after work today on what turned out to be a solo trip. My buddy had been there all day with another guy and the fishing had been very poor. Upon my arrival they were ready to head elsewhere. I checked some of their holes with my Aqua Vu Micro underwater camera and determined there were plenty of fish hung up in the weeds. I tried to get them to stay telling them they will turn on and we would just have to wait them out! 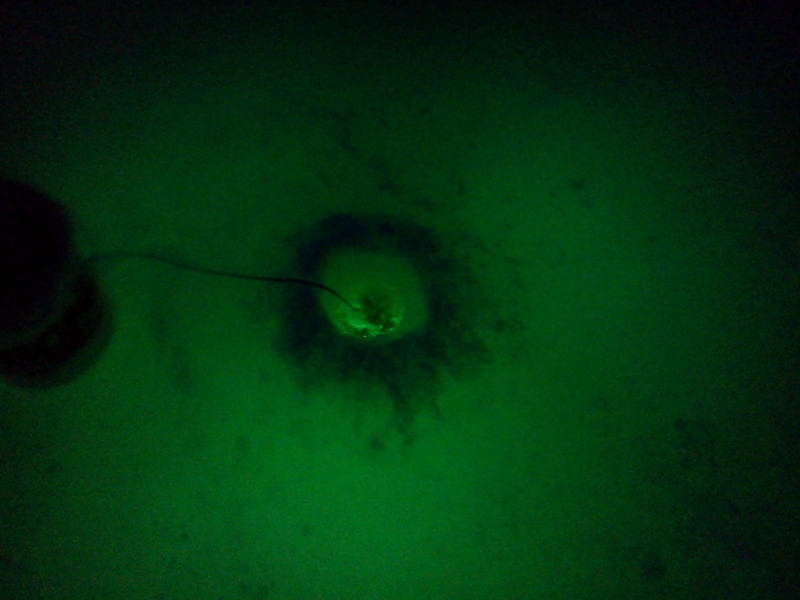 I punched a series of holes along a 4-6 foot contour that we fished for a while. 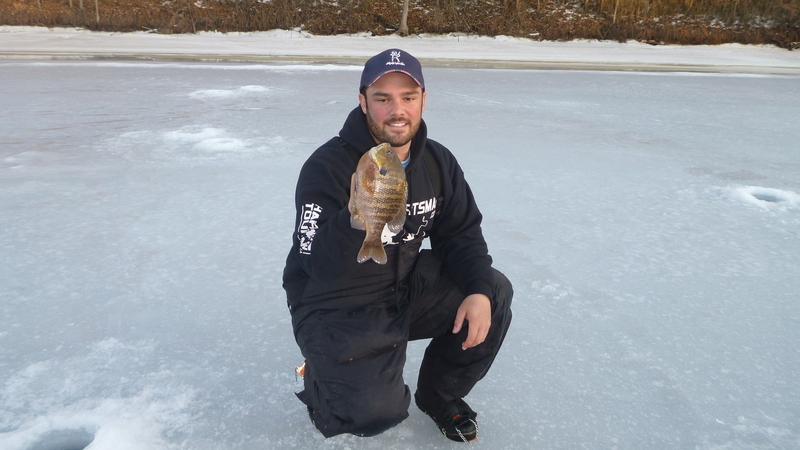 It took a bit but the first fish I got onto was a nice one – a bluegill just shy of 10″! I asked them if they were going to stay after seeing the gill and they decided not to. So off they went to a different setback and back I went down the hole. 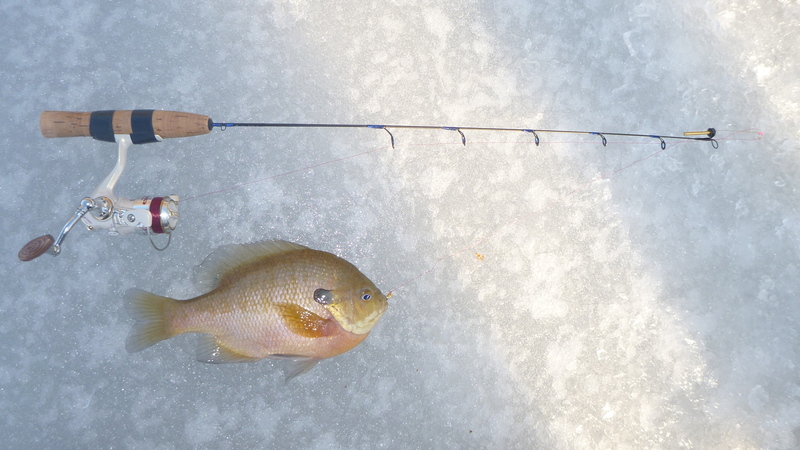 As they drove by me on the main road, leaving me the entire honey hole to myself, I pulled another decent bluegill. For the next four hours I pulled fish after fish. The series of holes that I initially punched held fish at both ends but not in the middle. I extended my rows in both directions and then went back and forth fishing until I exhausted the current supply of willing to bite fish on either end. I always try to keep track of the number of fish I catch while I am on the Connecticut River but a few times during the excitement today I lost track. My total was somewhere between 210 – 220 fish. Three of fish were perch, around 35 were black crappie (20 were 8″ or more), and the remainder were bluegill/pumpkinseed (5 were 10″ or more). I only kept seven fish today. Two perch, four bluegill, and one pumpkinseed. Just enough for a two person meal. Today was the first time in a while I caught more fish without my Vexilar than with. The weeds were so thick in most holes that it did no good to use a flasher as the whole screen was red. Knowing how deep the water is and using the camera to determine what depth most fish are holding at made it easy enough to fish. Today the majority of the fish were between 1.5-2 feet off the bottom. My strategy was to use a rod with 6 pound Cajun Line and the drag cranked tight. This way I could set the hook hard without spooling out any additional line and land a larger fish with tight drag having less concern of breaking off if the opportunity presented itself. For the most part the fish wanted the jig moving fast but vertically no more than an inch. I focused on watching the line a lot more than normal today. Most times the fish swam to the side with my bait rather than biting it. It seemed a lot like smelt fishing! Some lakes have a great night bite for Crappie, some don’t. The lake I fished last night was one that does not. The Hydroglow works sweet though. I still can’t get over the radius of light that this thing gives out, it’s truly amazing. If you like to fish at night check these out. You can also hardwire them to your boats for summer time fishing, these would rock night fishing for trout! Here’s a look a the light in action. We’re planning on getting some underwater shots as well, more to come.